I absolutely LOVE Canada goose hunting. Something about how receptive these birds are to goose calls really makes them a favorite to hunt. Now don’t get me wrong, I love duck hunting and shooting ducks as much as the next guy, but lately goose hunting has been at the top of the list for me. Canada geese carry a bad name among many waterfowl hunters, whether it be “they are no good to eat” or “they are big dumb park birds that anyone can hunt successfully”….I feel like I have heard it all. 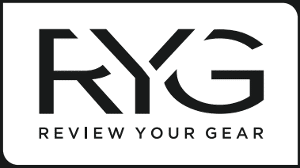 Want to know my opinion? Anyone can throw a robo duck out on a marsh and shoot ducks. Even without the slightest bit of skill on a duck call…..heck, you don’t even need a duck call. And not good to eat? Please I dare you to try my favorite goose recipe and tell me they aren’t good to eat…..
What makes goose hunting so appealing? 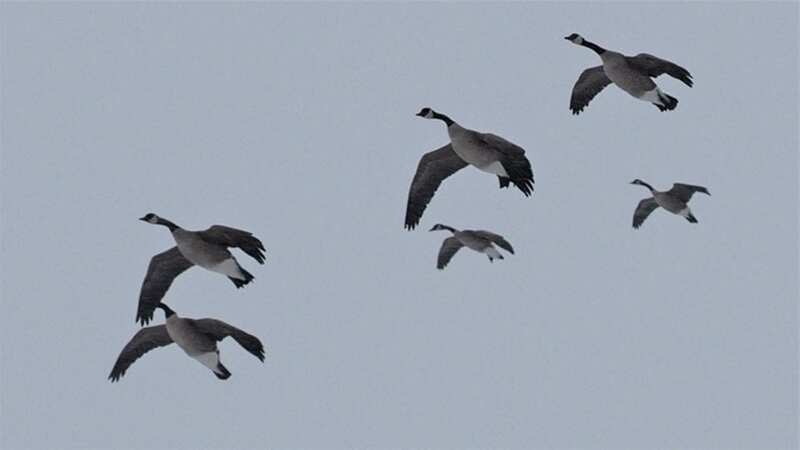 There is nothing like watching a flock of big Canada’s do a hard bank towards your decoy spread when you grab their attention with a goose flag. Or when you give them the perfect note on your goose call and watch them drop into your decoy spread with reckless abandon. Some of you maybe have read my article on hunting opportunities during the Early Goose Season, but for those of you who did not, I’ll give you a quick rundown. Scout, Scout, Scout, and scout some more. I cannot stress this enough. During the early season, canada geese are not in near the numbers they are later in the season when migrating birds fill roosts. Find your birds on their roosts. Birds during the early season will hardly ever roost hop like they will later in the season. Once you find the roost, locate a food source in close proximity. 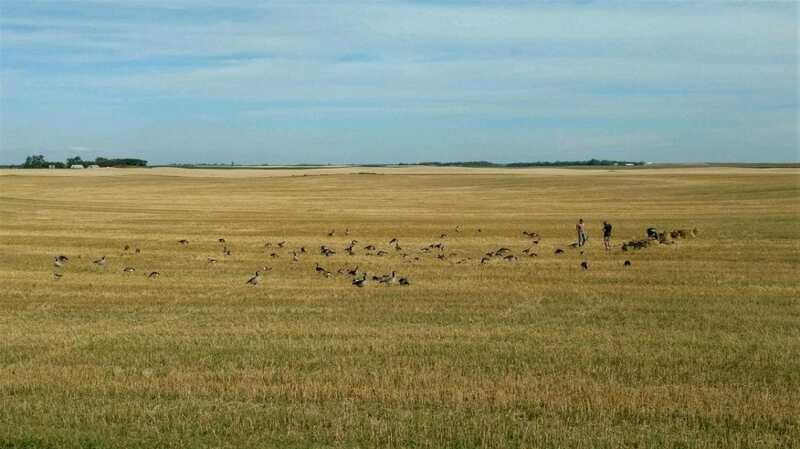 Not only will their be limited grain harvested during the early season, Canada geese WILL NOT fly far to feed. Save the corn fields for late season. Get permission and mimic exactly what the birds are doing in the fields. Set up on fresh droppings, in the EXACT location you last saw them. Let them leave the field naturally and back to water to roost before setting up. You can often times bump ducks off a spot and have them come back, RARELY will geese do this. While goose calling during the later part of the season might be super critical, this is not the case during the early season. You gotta remember, many of these birds have never seen a decoy or heard a goose call before. Less if often more. 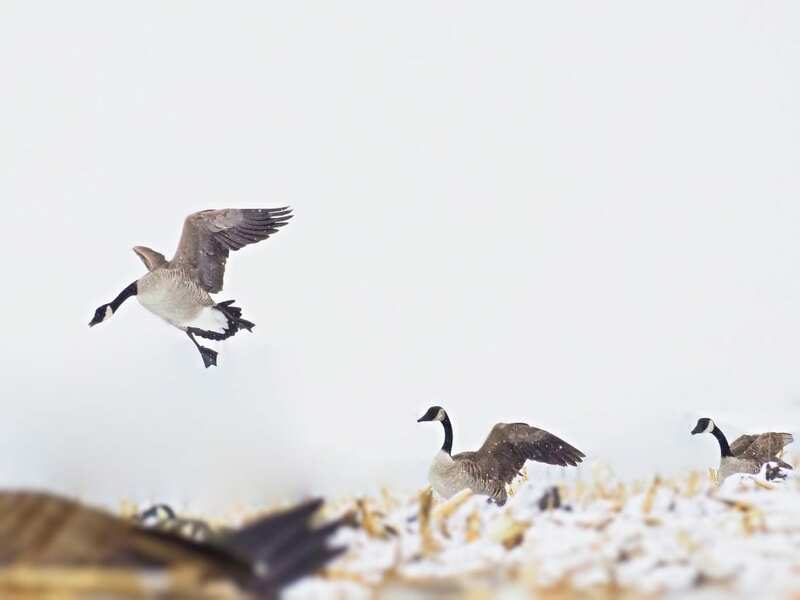 Decoy Placement Matters – Use small bunches of decoys to mimic family groups. This also seems to help keep birds from landing short. Early in the season, Canada geese are still in their family groups and often times do not intermingle with other flocks of birds until the weather starts to cool off. This can be a very difficult and frustrating time of year for many so I wanted to share a few late season goose hunting tips are not just for new hunters. This is the time of year goose hunters earn their stripes. Cool turns to cold, which soon turns to down right FRIGID. Ponds and marshes are frozen and the canada geese are keeping small pockets of water open and utilizing rivers and moving waters to roost. Fields are often snow covered, and birds have had as long as months to figure out areas to avoid and become patterned to safe areas. Young, dumb birds have either become wise or been eliminated from their flocks. THIS is when it gets FUN. When EVERY decision you make truly matters. Many of the same tips from early goose season still apply, just on a magnified level. Scouting is as important as ever. At this point in the season, hunting on private land is going to DRAMATICALLY increase your chances. Odds are any public land that was being utilized by geese has been hunted and burned already. Birds during the late season have had weeks to months to find the safe areas and fields. This can make obtaining permission difficult, as there is more often than not a reason the birds are safe in the fields they are in. Do not let this discourage you. Find your hidden gem. We use a variety of full body decoy spreads late in the season. Usually we go REALLY big, or REALLY small. Most people are usually running around the same number of decoys (50-100). Mix it up. One of my favorite things to do is mix in a few (3-4) snow goose decoys throughout the decoy spread to add realism and visibility. Late season is also my favorite time to hunt geese over water. Usually once canada geese begin migrating south, they become fairly predictable. Migrating geese love a good water spot to rest, making this an incredible hunting opportunity. Ducks and snow geese tend to follow the full moon phases and are more frequently impacted by weather. Canada geese also follow these patterns, however, their migration tends to be much more drawn out. Usually once they start migrating, most north wind days will bring at least a few new birds. Plan to hunt these days. Pay attention to the little details. Flagging is critical and often times we utilize it more often than calling to attract birds. Calling can make or break you. Get yourself a good short reed and spend some time to learn the basics. Don’t try and do too much, keep it simple if you have yet to master some of the more advanced calling sequences. Hide yourself and hide yourself WELL. I hunt a high pressure area with lots of other hunters and decoy spreads within eyesight many days out of the year. Nothing gets me licking my chops more than seeing the guys in the field next to me “hiding”. IF I CAN SEE YOU FROM A HALF MILE AWAY, THE GEESE CAN TOO! Utilize layout blinds or backrests. Take advantage of the cover around you to make yourself blend in. SPEND THE TIME and do it right. Think of all the time, money, and effort that went into making this hunt happen…..Do not waste it with a bad hide.